“It’s kind of like that iconic rock in Lion King, you know, pride rock? That’s where we’ll camp on the third night”. . .
Said Mike Chambers, professional ultra runner and MSR athlete ambassador. It wasn’t until I heard those words on a planning call a few months before our trip that it sank in: I was actually going to Kenya! MSR was taking me and a group of journalists to discover the benefits the MSR Impact Project is having on a local community outside of Nairobi, Kenya. For the past 3 years, MSR has had a dedicated division within their Seattle-based company committed to Global Health work. For close to 50 years the brand has been developing technologies to keep outdoor enthusiasts safe in the backcountry; in 2015, they started using this experience to develop technologies to benefit people without access to basic needs, like clean drinking water. In June of this year, MSR launched the MSR Impact Project, a collaborative endeavor to give communities in need, access to these new technologies. To do this, MSR has partnered with Flying Kites, a local non-profit founded by Mike Chambers and his wife, Leila. Mike and Leila have been working tirelessly since 2007 to enhance the educational opportunities for students in this school district located in Njabini, Kenya. What started as an orphanage has since transformed into a school of excellence, in which they are not only ensuring the kids have what they need to learn (everything from uniforms, school supplies, books, food, and clean water) but also provides teacher training to Flying Kites teachers and their partner schools. We departed the Jomo Kenyatta International Airport into the sunny daylight around 3pm on Wednesday, lugging seven large MSR-branded duffels full of Hubba tents and deep dish bowls we’d use later in the week. After having gone through multiple time zones, security checks, sleep cycles, and airplane meals - and over 20 hours of traveling - I walked down the exit ramp into the most foreign place I’ve ever been. Aside from tight hips from sitting for so long, I was feeling surprisingly great: awake and anxious to see if Stanley, our driver to the Flying Kites school, would be waiting for us as planned. Before I could even look up to scan the crowd we heard our names and a smiling man with a wooden ‘Flying Kites’ sign at the front of the group ready to greet us. The MSR team and I arrived in Kenya a day early to make sure we had everything organized and the itinerary set before the five journalists arrived. A few trip highlights we had on the schedule included: two nights of camping (including a night on pride rock as promised); a hike up Elephant Mountain with Kenya Wildlife Service (KWS) armed guards in case we did, in fact, encounter elephants; a game drive in Nairobi National Park; a hike around an extinct volcano called Mount Longonot; a visit to three primary schools in rural Njabini to deliver the Community Chlorine Maker machines; and a boat ride on Lake Naivasha to see hippos. I was instantly mesmerized by the entire experience, fascinated by the cultural differences and contrasting way of life, and I could tell that this would be a trip I would never forget. On the fifth day we went to visit Chania Primary School, a school right next to a slum with over 800 students enrolled. To give some perspective: on average, the government of Kenya allots the equivalent of about $14 (US) per year per student, compared to the $10,000 average the US government spends. Twenty-five wide-eyed students stared at us, a bunch of Mzungus (what Kenyans call white people), wondering why we were interrupting their science class. “First, we’re going to pour the salt to this dotted line, do you guys see that line?” The students tentatively nodded, clearly still unsure about who this Mzungu was at the front of their classroom. Zac continued with his demonstration, carefully pointing out each step of the procedure, complete with a little shake-the-salt-water dance that drew giggles from the students. The headmaster, Warucu, injected some basic science questions into the demonstration - we were, after all, interrupting their science class - and the students were clearly engaged. When Zach plugged the chlorine maker in, it was obvious that the student’s interests were piqued: they all moved a bit closer to get a better view. When he asked for a volunteer to push the button, all hands eagerly shot up. Zac went on to explain that this little machine is making chlorine, which can be used to clean their drinking water, which will make it so they don’t get stomach aches. In just the 5 minutes it took for this one process they created enough chlorine to treat 200 liters of water. Assuming that each student drinks 1 liter of water per day, and there are 800 students, they figured out that it would take them 20 minutes to make enough chlorine so that they’d all have enough drinking water for the entire day. After Zac finished, it was the student’s turn to practice. 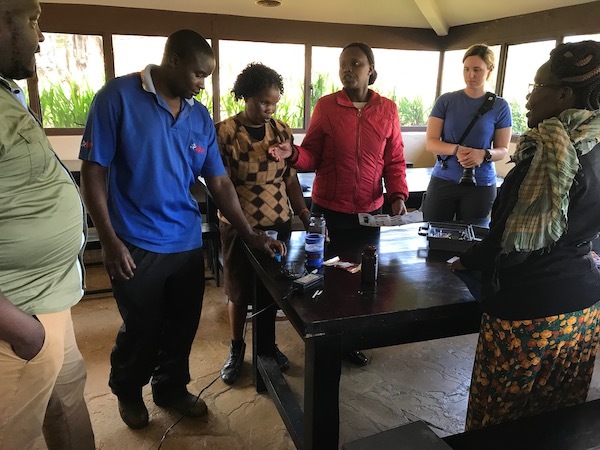 I’ll never forget the 14-year old girl who stood up in front of her classmates and, with 100% accuracy, explained to her peers how to use this new device that would bring them safe drinking water. I was amazed at her confidence as well as how perfectly she understood and charismatically described how the chlorine maker works. Watching the students learn how to use the chlorine maker and begin to understand the importance of clean drinking water, I was struck by the impact this project will have on the community, and also the immense collaborative effort it took to get here. In partnering with Flying Kites, MSR has found the perfect way to get their technologies into the communities that need them the most. This is the exact principle behind the MSR Impact Project: Flying Kites will lean on MSR, the expert in designing technologies to solve global health issues; MSR will lean on Flying Kites to be the liaison in ensuring that the chlorine maker is continuing to benefit the community. I feel like I blinked, and we were on our final day in Kenya. We took a game drive through Nairobi National Park in open-roofed Land Rovers, pointing and smiling at lions, rhinos, giraffes and zebras. It was the perfect way to wrap up our time in Kenya, hair blowing in the breeze with antelope and gazelle gallivanting all around us. As the sun was setting we reflected on the trip over a pizza dinner at a restaurant located in the middle of the National Park. This trip was a life changing, eye opening experience that will forever have an impact on my life. I am still digesting all of the events and experiences of the trip, but one thing is for sure: I understand why they called it the Impact Project.